Hello My Glamorous Friends!! 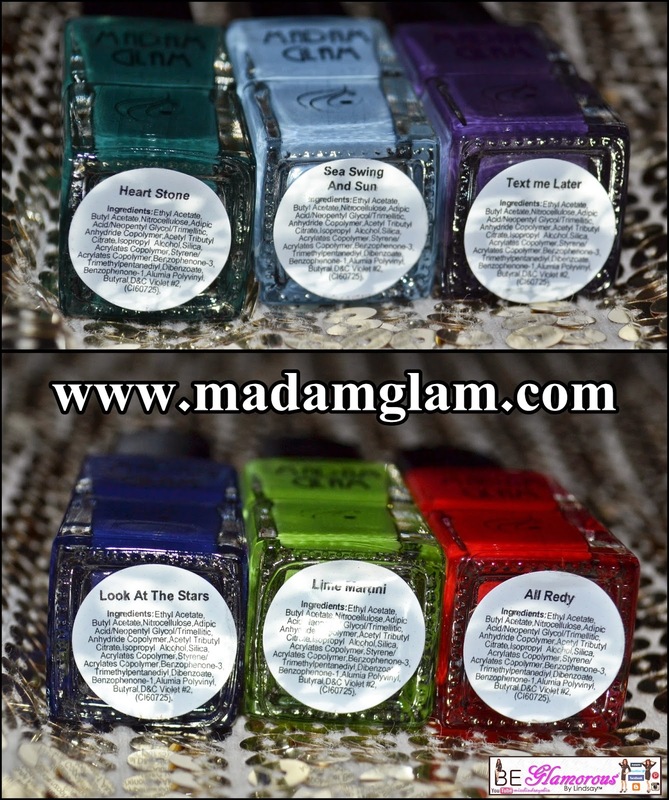 I have Madam Glam Nail Colors to share with you today! These gorgeous shades are long lasting and becoming a new favorite in the beauty world. Check out the website for yourself. There is currently a 40% off sale and free shipping with a $30 purchase. My nail polishes arrived safe and secure and in some pretty cool boxes. Each shade is $10.95 and there are a variety of gorgeous shades available. I swatched these onto some fake nails and this is only 1 coat of polish. So pretty!! Check out my haul video and nail tutorial below. 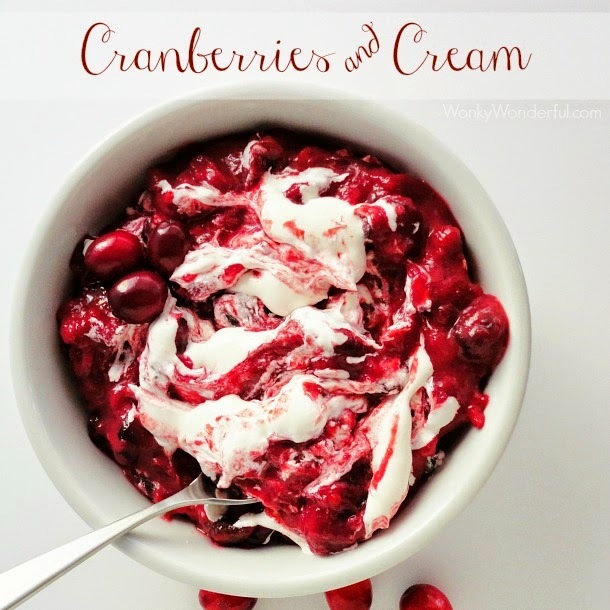 Now here is a great Thanksgiving Recipe I found at Wonky Wonderful, be sure to check out all her Thanksgiving and all her other ideas too!! It's a wonderful blog! Hello My Glamorous Friends, today I am going to share with you a photo shoot my love and I spontaneously shot last night at our local laundromat. We had a blast and learned.. its really OK to have a photo shoot ANYWHERE and ANYTIME.. hahaha <3 Enjoy! I found my dress for only $15.82 with FREE International Shipping!! Hello My Glamorous Friends!! Welcome Back!! This time I have a HAUL for you from Silk Naturals. They have some new fall/winter shades and some other really great products I am going to share today. This is the second time I have gotten Silk Naturals and absolutely love every product. I carry a Slick Stick in my purse at all times. They are such a handy little moisturizing lip color. The gorgeous little petite tubes come in a lip glaze slick stick and lipstick!! All so pretty!! from disappearing as you age. LIVE is a sheer, cooler toned berry pink. It adds the perfect pop of casual color. REPLAY is a ravishing cool toned berry red with a cream finish (no shimmer), and a moderate level of coverage. SWING has a base of sheer plummy pink with a fair bit of aqua shimmers to make your teeth look a little whiter. It's refined enough for the office, but casual enough for flipflops and sundresses. The sparkle is not at all over the top. Swing is bound to become a real staple for you- grab one for your purse, and one for your desk drawer. SCRIPT is a deep chocolaty brown with just a hint of plum to make your teeth look a little whiter. It's been the office favorite, and it's perfect for winter. CLIFFHANGER is a cheerful, creamy full coverage coral with a creme (no shimmer) finish. It's the more muted winter version of B-52. You'll love our new creamy stay-put formula- it's moisturizing, comfortable, and lasts a few hours. You can blot it to make it matte, or set it with a little blush to make it last for ages. It's richly pigmented, has a slight natural vanilla scent, and has a shelf life of at least a year (2 or 3 years wouldn't be surprising). put it next to the other three colored primers. I love these, a tiny dab goes such a long way. and then apply your favorite eye shadows. Clear: Stick 'Em adheres mineral eye shadows including glittery pigments, and helps enhance the color of mineral pigments. . It also doubles as a foiling medium for wetlining your eyes. There is no oil in it, so it plays well with matte colors as well. It dries a little bit tacky, so pigments really stick to it, and is completely clear. For some women this will be a great eye shadow primer- people with more oily lids may want to apply their favorite primer under the Stick 'Em to hold the pigments all day. 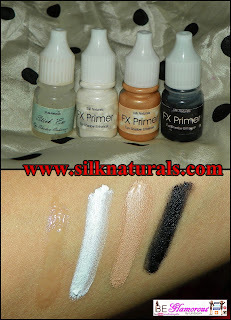 White FX Eye Shadow Primer & Enhancer is a somewhat sheer white primer that helps hold eye shadow in place, lightens the tone of the eye shadows, and helps make duochromes and interference colors pop a little more. 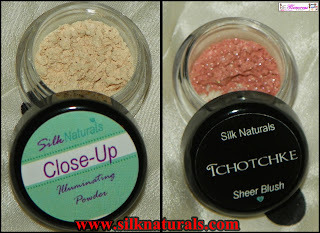 It works well with either matte or shimmer pigments. It's great for evening-out the skin tone of your lids. This isn't quite a sticky as Stick 'Em our regular enhancer, but it still keeps everything "wet" looking and pops out any highlights. It's not super useful for adhering glitter the way Stick 'Em is. Tan FX Eye Shadow Primer & Enhancer is a light somewhat sheer tan that helps hold eye shadow in place, and helps make duochromes and interference colors pop a little more. It works well with either matte or shimmer pigments. It's great for evening-out the skin tone of your lids. This isn't quite a sticky as Stick 'Em our regular enhancer, but it still keeps everything "wet" looking and pops out any highlights. It's not super useful for adhering glitter the way Stick 'Em is.To use just apply a very thin layer to your lids. Allow to dry for a few seconds, and then apply your favorite eye shadows. Black FX Eye Shadow Primer & Enhancer is a deep, dark rich black that adds an amazing effect when applied under eye shadows. This isn't quite a sticky as Stick 'Em our regular enhancer, but it still keeps everything "wet" looking and pops out any highlights. It's not super useful for adhering glitter the way Stick 'Em is.Try it with our color shifting pigments- Antenna, Episode, or Frequency, or our morphing pigments- Sprite, Opal, and Gasp.To use just apply a very thin layer to your lids. Start at the base of your lashes an blend up. Use a really tiny amount, and add more for a richer tone.Allow to dry for a few seconds, and then apply your favorite eye shadows. Yay!! New eyeshadows, these are oh so much more beautiful in person. I love these shades!! I'll be using these in some of my upcoming videos. I can't wait. FREQUENCY is holographic pigment! Most of the time it looks purple, but as the light, or your viewing angle changes so does the color. It shifts from purple to a spectrum of red, silver, green, and blue. You must apply them over a primer to get the full effect- otherwise they just look like white powder. Apply it over black FX Primer for a bold, intense color shift, or over Stick 'Em for a more stuble (but still flashy) effect. ANTENNA is an intense acid green with a red, gold, and peach holographic shift that changes with the light, and your viewing angle. You must apply them over a primer to get the full effect- otherwise they just look like white powder. Apply it over black FX Primer for a bold, intense color shift, or over Stick 'Em for a more stuble (but still flashy) effect. EPISODE is a silvery teal holographic pigment. Most of the time it looks teal, but as the light, or your viewing angle changes so does the color. It shifts from teal to a spectrum of red, silver, and purple. You must apply them over a primer to get the full effect- otherwise they just look like white powder.Apply it over black FX Primer for a bold, intense color shift, or over Stick 'Em for a more stuble (but still flashy) effect. P.S. is a light peachy orange with a toned-down shimmer finish. It's made to match Satellite, but try it with other warm shades like Cloudberry, or Homecoming Queen. BOOST is a deep peachy red with a bold layer of fine gold interference. It's fantastic as a crease color on lighter skin tones, and is a great lid color for deeper skin tones. PILOT is a light opaque taupe with a strong layer of pink interference. The base layer is opaque even over a primer, and the duochrome pops out beautifully when applied over Stick 'Em Primer. Try it with Catalyst, or Prowl- gorgeous! REALITY is highlighter that adds a subtle pink glow to your look. You can use it on your eyes, lips- and it's especially wonderful on your cheeks. 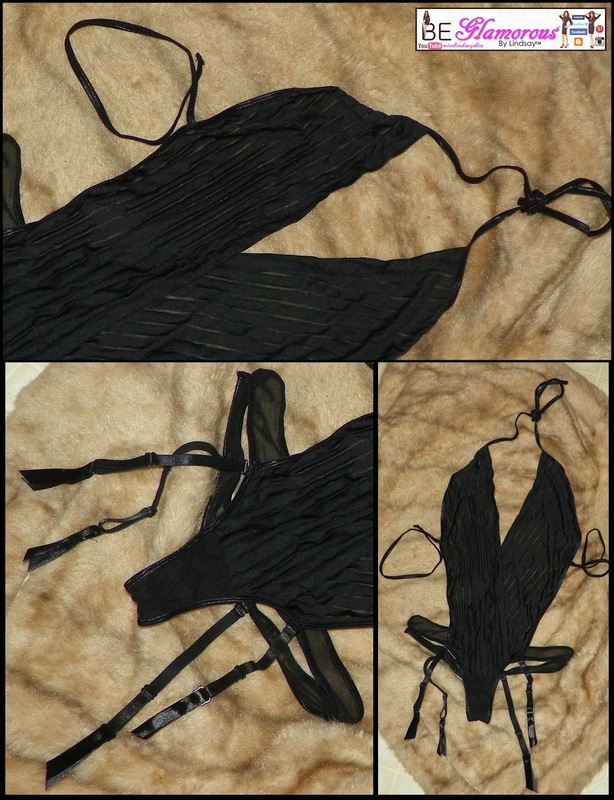 It's easy to wear, and just adds that little bit of special. NETWORK is a very light opaque pink with a layer of green duochrome. The base layer is opaque even over a primer, and the duochrome pops out beautifully when applied over Stick 'Em Primer. It's a great base color for a cat eye look, or fantastic with Volume blended into the crease. VOLUME is a bright fuschia with hints of pinky purple duochrome. It's beautiful as a crease color with Network, or give it a starring role in a more dramatic look. PLOT TWIST is a deep reddish brown with dramatic green duochrome. It's made to match Story. 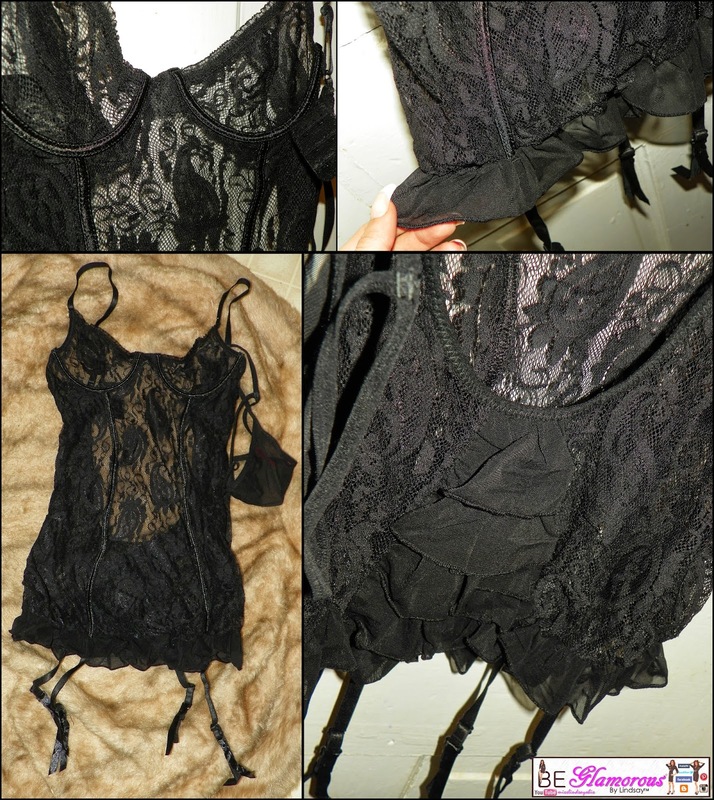 STORY is a very light opaque tan with just a hint of pink, and a layer of green highlights. The base layer is opaque even over a primer, and the duochrome pops out beautifully when applied over Stick 'Em Primer. It is made to match Plot Twist. SATELLITE is an opaque light peach with purple duochrome, and gold shimmer. The base layer is opaque even over a primer, and the duochrome pops out beautifully when applied over Stick 'Em Primer. It's made to match P.S. and I also got a gorgeous shimmery blush. Close-Up is a lightly tinted shimmery Illuminating Powder. It's great as a finisher, and helps perk-up a dull complexion with fine gold and pink interference pigments. This is inspired by MAC's Lightscapade MSF, but slightly less glowy, and with our own gorgeous pore-refining flawless finish, oil absorbing base. 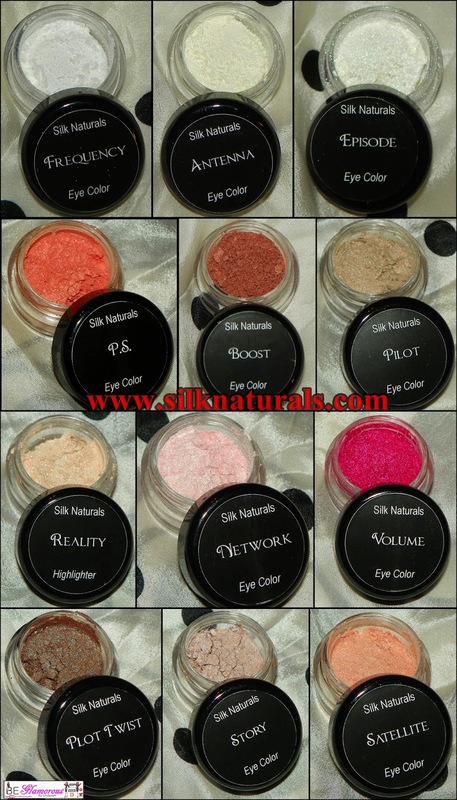 Defiantly take a moment out to check out Silk Naturals, so many beautiful natural products.